Lansdowne Borough just got a new website. Another error that came my way this morning was the SSPI context error when trying to connect to a SQL server. 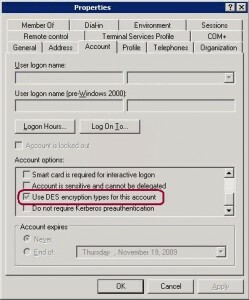 After trying some suggestions on the Cannot generate SSPI context support page, I stumbled on a forum post that discussed checking how the specific account was setup on Active Directory. It turns out that his account had an option enabled that was set to ‘Use DES encryption types for this account’. After disabling this option he was able to connect without any problems. Select a primary care doctor from the plan network and he or she directs your medical care. This doctor gives you referrals when you need to see a specialist, like a dermatologist. Also, with an HMO, you must go for medical care within your plan’s network – or you won’t be covered (except for emergencies). Visit any doctor – in the network or out as there are no referrals. Moreover, you don’t have to pick a primary care doctor. Earlier in the month, for a class discussion we watched a video titled ‘EMR/ EHR Done Right’. Essentially, how life should be after you’ve implemented electronic medical records. To be honest, after watching the video, you wonder why things aren’t already setup as shown. Everything in the video, boring as it may be, is feasible today. Yet, because there has never been a push for standardization or interoperability in the industry, videos such as this show up. It is definitely time for health care reform. Another new store is coming to Lansdowne. Provisions Market is a business which encourages friends and community to gather and nourish their body and spirits with affordable, seasonal, sustainable, and organic foods. We want to serve as an example of eco-friendly business with an emphasis on educating Lansdowne residents and their children about where food comes from and how to and why it is so important to support small farmers and artisans.